In late October 2012, three feet of water crashed through Eyebeam, a technology and new media non-profit located in a vast warehouse space on 21st Street in Manhattan’s Chelsea neighborhood. 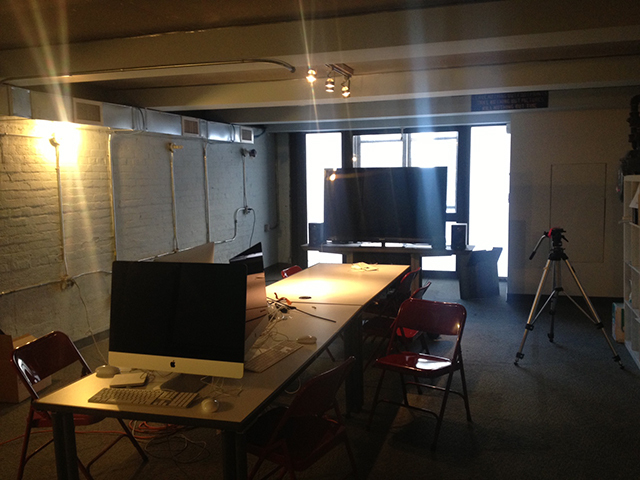 The ground-floor location proved catastrophic as the flood poured over from the Hudson: Eyebeam sustained damage to just about every part of its operation, from studio space and galleries to the institution’s all-important digital archive, stored on vulnerable media formats like hard drives and storage cassettes. 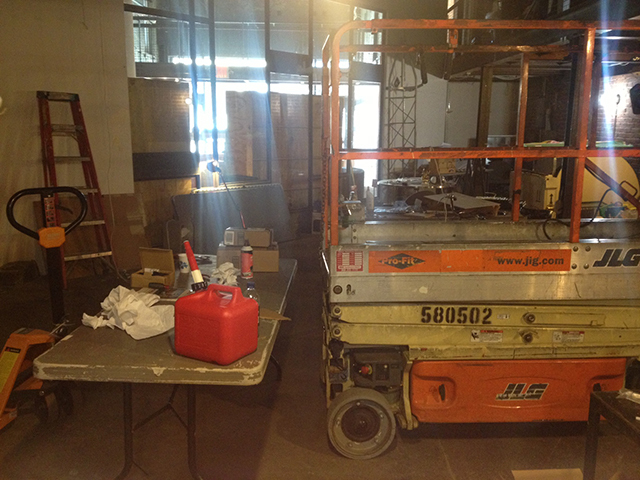 Following the storm, Eyebeam closed through November to recover from the damage. Volunteers rushed in to help conserve the archived media and $250,000 worth of equipment, computers, and books corroded by the salt content and toxicity of the Sandy flood water. As Eyebeam resident and new media documentarian Jonathan Minard, who created a video of the conservation process, told Hyperallergic, the emergency pulled supporters together. “Disaster became the impetus. Our organization’s long-delayed plans to secure a collection stored on unstable formats now had critical urgency,” he said. 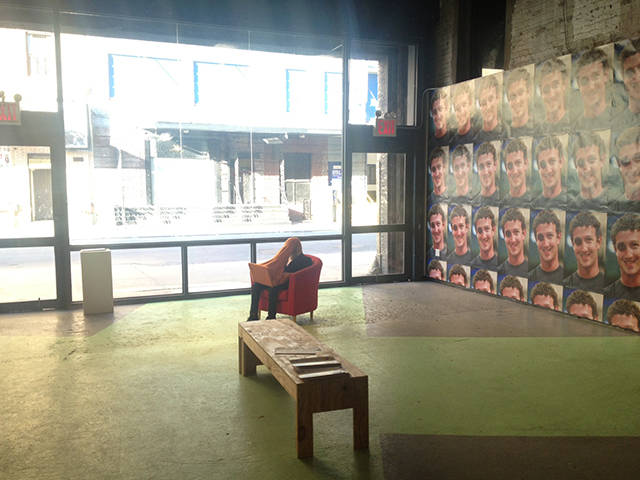 Walking through Eyebeam today, the space looks good as new. Better, in fact. The floodwater meant that the lowest three feet of all the institution’s wall space had to be replaced. Freshly painted, the walls look if anything more solid than they were before. There’s a new cohesion to Eyebeam’s warehouse loft that is brought together by their continuing renovation, an initiative meant to open up the space that has started with a new entrance lobby and remodeled bookstore with custom-made modular furniture. I walked through Eyebeam with Roddy Schrock, the institution’s director of programs and residencies, to get an idea of what had been fixed. As simple as it looks, the repair took a lot of effort — due to the flood, “things that had been on one side were all of a sudden on the other side,” he explained. “The whole storage area was completely knocked out. We keep finding things that were left over from the storm.” In the rear of the space, back rooms are filled with orphaned computers and bins of detritus. But it wasn’t just the disorder that was threatening. “One of the worst parts was the mold and the potential for mold; the floors had to be cleaned and disinfected,” Schrock said. Though the building is back to normal, problems remain. The institution’s equipment is still in shambles, and conservation efforts on the archive are ongoing. 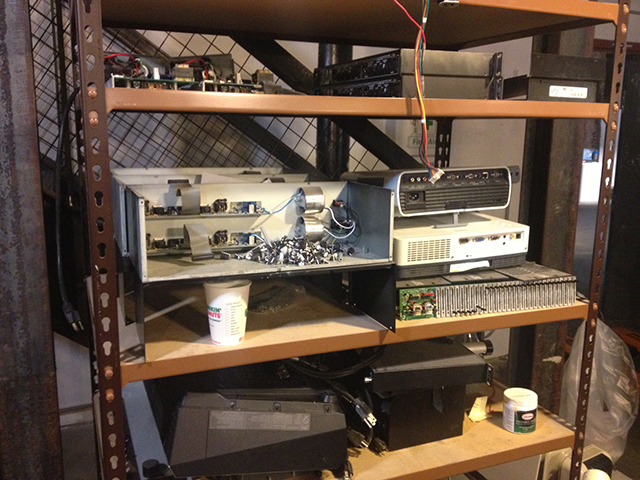 Piles of disk drives and storage devices mount in the warehouse’s out-of-the-way corners. Staff and resident artists, exiled from the space for months while it rebuilt, are trickling back in, occupying desks and enlivening workshops. The goal now is to get back to business, Schrock said. “Being in Chelsea, we’re not a gallery, but we have an energy that we can bring to the neighborhood that’s a really valuable asset to the whole neighborhood.” That energy is manifesting itself in the new decorations that are dotting the fresh space. Graffiti by F.A.T. Lab and other human touches are restoring Eyebeam’s personality.